The Atlantic Coast Conference (ACC) is on a talent search for top student innovators who are inventing the future. 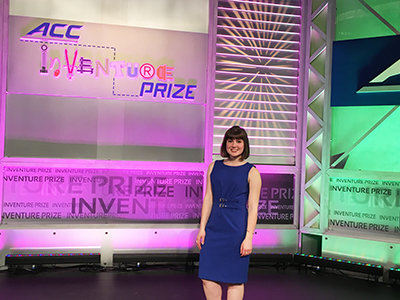 Teams from Syracuse University are now being recruited for the InVenture Prize, a televised “Shark Tank”-style competition open to student startups at the 15 colleges and universities that are part of the ACC Academic Consortium. Last year, Syracuse University entrepreneur Kate Beckman ’17, founder of FreshU and now a graduate student in the Newhouse School, made it to the final five of the InVenture competition at Georgia Tech, which was broadcast live and streamed by PBS. The InVenture Prize Competition offers the only chance for ACC student innovators and inventors to compete in a televised pitch event in front of a live audience. Last year, Syracuse University entrepreneur Kate Beckman ’17, founder of FreshU and now a graduate student in the Newhouse School, made it to the final five at Georgia Tech, which was broadcast live and streamed by PBS. The Blackstone LaunchPad at Bird Library will be hosting the campus qualifier to pick the top team to represent Syracuse University. Online applications are due Feb. 9, with a campus pitch competition on Feb. 16. The winning team selected by a panel of judges will receive an all-expense-paid trip to Georgia Tech in Atlanta for the finals April 5-6, and a chance to compete for $30,000 in prize funding. In addition to Syracuse University, the 15 participating colleges are: Boston College, Clemson University, Duke University, Florida State University, Georgia Institute of Technology, North Carolina State, University of Notre Dame, University of Louisville, University of Miami, University of North Carolina-Chapel Hill, University of Pittsburgh, University of Virginia, Virginia Polytechnic Institute & State University and Wake Forest University. Full-time, degree-seeking undergraduate students must comprise at least 50 percent of the registered team members. Individual teams with only one student are eligible to compete. Teams with generated revenue or venture capital funding in excess of $100,000 are not eligible to compete. Entrants should be the original creators, inventors or owners of the intellectual property (IP) underlying their invention. Any co-invention with non-students or any other third party outside the university must be fully disclosed during registration to determine if the outside contribution was substantial. A team whose idea or invention qualifies as university-owned IP is not eligible to enter. Applications may be submitted online. Applicants selected for the Syracuse competition will create a pitch deck for the campus competition. Coaching in advance of the campus finals is available through the Blackstone LaunchPad and the Falcone Center for Entrepreneurship’s Couri Hatchery. Students who participated in Invent@SU—the Syracuse University invention accelerator— are strongly encouraged to apply. Students may make appointments to meet at the Blackstone LaunchPad with experts from the U.S. Small Business Administration and New York State Small Business Development Center for technical assistance. Appointments for coaching or meetings with business advisors or professional service providers can be made by e-mail: launchpad@syr.edu.